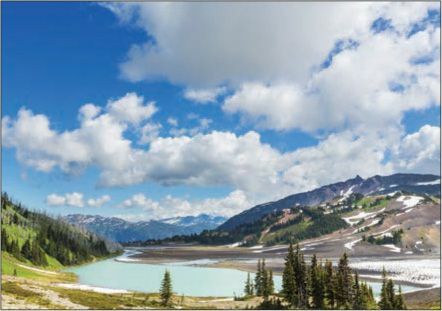 About those 180 miles: The fact that 144 of them are on the mountain-lined Icefields Parkway is “a good news/bad news proposition.” The good news is the scenery—and so is the bad news, because you may want to stop so often that the drive could take most of a day. You’ll surely want to stop 65 miles south of Jasper at the magnificent Columbia Icefield, the mother of eight glaciers and one of the largest nonpolar ice fields in the world. Nearby, the Glacier Skywalk offers a chance to stroll out on a cantilevered pathway and gaze through the glass floor at the spectacular valley below. Jasper National Park surrounds you at this point, so the things to see and do multiply: “mountains and waterfalls and trails and lakes and rental canoes and, of course, bears and elk and bighorn sheep.” Motorcycle tours can by booked in Jasper, and that SkyTram lifts passengers 7,500 feet up Whistlers Mountain, leaving a rewarding 600-foot climb to the summit. At Jasper Park Lodge, you can rent either a room or a cabin of your own. The town itself, fortunately, never experienced a building explosion. It’s “still mellow, relatively unrushed”—and one of the Rockies’ best-kept secrets. At Jasper Park Lodge (fairmont.com/jasper), peak-season rooms start at $530.